Think about the sources of carbon-based energy--coal, petroleum, propane, natural gas. One thing they have in common is that they are tangible, transportable products that are not consumed in transport. This also means that they are finite--as well as being a part of several causing environmental problems. Solar and wind power are different, in that they capture energy from constantly-renewing sources. But unless that energy can be used when it is produced, it needs to be stored in some separate medium so that it can be transported and/or used later. So far that medium has been batteries. Battery technology is becoming more efficient, but it does not represent a cost effective, long term solution in a world where a larger and larger percentage of energy is produced from renewable sources. Lead-acid battery technology has evolved into newer lithium ion batteries. And salt, silicon and graphite are also being studied as more efficient and economical battery materials. But batteries add to the expense of renewable energy...and may not be the best solution at all. One company is doing something totally different, with demonstrated effectiveness. 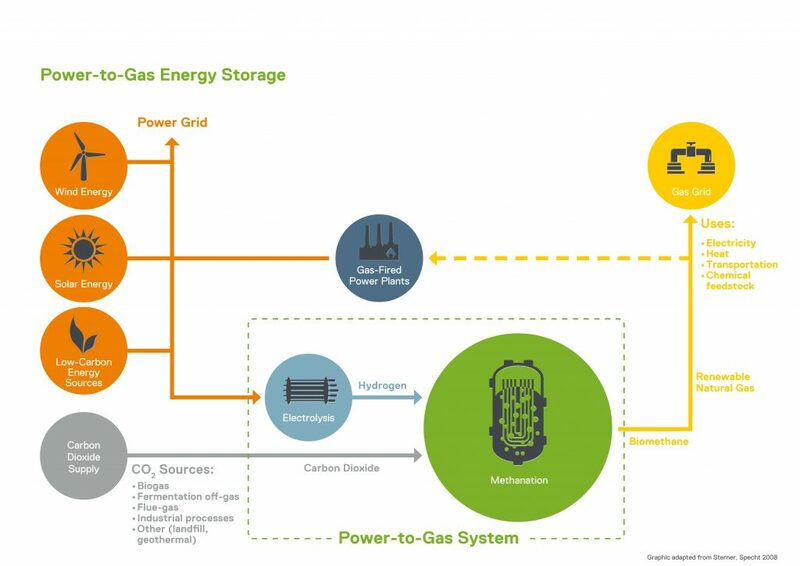 The German company Electrochaea GmbH, in its own words, "has developed a commercially viable and disruptive solution for utility scale energy storage, grid balancing and carbon reuse." In other words, Electrochaea has a completely new approach to solving sustainable energy storage: converting it into methane. Methane gas is the primary component of the natural gas that powers many hot water heaters, furnaces, stoves and clothes dryers, so we already know how useful it is. Moreover, the infrastructure for delivering methane to the final consumer already exists. A "commercial scale demonstration facility" has been built by a Danish Electrochaea subsidiary, and their initial goal is to decarbonize the Danish grid. A major revenue stream will be the sale of natural gas. Source: "Batteries can't solve the world's biggest energy storage problem. One start-up has a solution." by Akshat Rathi, Quartz, December 11, 2017. Describe the process used by Electrochaea. Do you see any places where there may be bottlenecks or problems? Do you notice any surprising benefits? How is Electrochaea organized as a business? Who has invested in Electrochaea? (see their About and Partners pages) Would you invest? Why or why not? What do other companies and energy industry observers have to say about Electrochaea's technology?